If you decide to travel to Iran, the moment you start planning you will start facing the first problems. Due to Iran still being under sanctions, you can’t use your bank cards and book online your hotels or domestic flights. 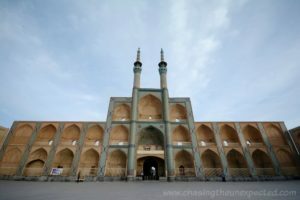 That’s why I created this extensive guide including both the places to visit in Iran in ten days if you are going for the first time and the practical tips you need to get by and properly organize your trip. Modern Persia is not just a big country, it’s also packed with historical places, art, and a diverse natural landscape. Since it’s your first trip, I suggest you do the so-called “classic tour” and tick off your list the most famous places to visit in Iran. Are you still wondering what are the best things to do in Iran? Read on and get inspired. INSIDER’S TIP: Iranian agency 1stQuest has a great tour package for Iran: 9 days for 369 euro is a pretty sweet deal! To know more check out our post on this Iran tour deal. Iran is very safe to visit. I have traveled to Iran with a woman friend of mine and we’ve never felt uncomfortable or in danger. Not only that, we also met many Iranian women traveling on their own. Buses running from one city to another stop at every police station along the way and an officer checks everything, depending on the province together with the dogs sniffing drugs. In the cities, the police are everywhere and keep streets safe. Moreover, last time I was in Iran, I stayed at a Tehran hotel by myself for about ten days. It was close to the Grand Bazaar, in a pretty “male-oriented” area as streets were lined with shops selling car spares, while at night it was very quiet. Yet, I’ve never had any issue either at night or daytime. The Iranian government puts a great deal of work in security and keeping the national border as safe as possible against terrorism and drug dealers. Sometimes it might seem extreme, but we should never forget that Iran borders with dangerous countries like Iraq, Afghanistan, and Pakistan, from where terrorists usually take off for their attacks. The requirements for Iran visa vary depending on your nationality. European citizens can get tourist visa either by applying at the Iranian embassy or consulate of the country of your residence or on arrival upon landing at the international airports of Tehran, Mashhad, Shiraz, Tabriz, and Isfahan. Both visas should allow 30 days, even though sometimes visa on arrival is issued for only 14 days. If you want to travel with the Iran visa already glued on your passport, travel agency 1st Quest offers the service. Fill in an online form and they will send you the authorisation code that you need to take to the embassy or consulate alongside the other required documents. The fee for the Iran visa service is 35$ or 29€ and you can apply directly from 1stQuest website. Click here to see the process and fees. US, Canadians and UK citizens cannot get Iran tourist visa on arrival and need to apply at the Iranian embassy or consulate (Americans at the Iran section of Pakistan embassy in Washington DC). All these nationalities must have a certified tour guide to be able to apply for a visa to Iran. To apply for Iran visa, you must submit also travel insurance. With 1stQuest, you can also buy online pretty cheap travel insurance starting from 15 euro. READ MORE: Check out my full post on how to get Iran visa. Many are the airlines that land in Iran. I travelled with Qatar Airways, Alitalia and Turkish Airlines, but also Etihad, Thai Airways, Emirates and others land in Iran. Depending on where you are departing from, these companies will have a stopover at the airport of their headquarter, so Doha for Qatar Airways, Rome for Alitalia, etc. There are also Iranian airlines IranAir and MahanAir flying from Europe and Asia into Iran, but due to sanctions, you can only purchase a ticket with them via their office. TIP: To avoid annoying airline surcharges, check out our guide to the best digital luggage scales. As I suggested in my tips on how to plan a trip to Iran, I don’t recommend you go for Nowruz: Iranians are on holiday for some 13 days, it’s hard to book a hotel, Tehran will be empty and shops, banks and, most importantly, exchange agencies will be closed, popular tourist destinations will be packed, lines for landmarks will be endless, prices will go up. The best time to travel to Iran is right after Nowruz. From April 2nd a pleasant weather, colourful blossoms, and everything back to normal is a guarantee for a perfect trip. Summer is very hot, especially in central Iran, where you are likely to go if you want to visit Iran for the first time, while winter is pretty cold and you’d rather enjoy provinces like Qeshm or Kish islands in the Persian Gulf unless you are into winter activities such as skiing. Autumn is mild in central Iran while it can be cold-ish in cities like Hamedan and quite pleasant in Tehran since the summer heat is gone. Prices will also be lower than in spring as it’s a less busy season. Dress code in Iran is always one of the most sensitive issues. I have had many people asking me what to and not to wear in Iran. Some even ask if they need to wear chador or hijab, with hijab meaning the full Islamic dress code. So not only the headscarf but in general a modest way of dressing and behaving. While I understand Iran as a travel destination is a pretty recent concept, there really is not much to fret about. So the short answer is no, you don’t need the hijab, nor the chador, neither the abaya (it’s not Saudi Arabia). Depending on where you go in Iran, there will be more or less conservative places, but usually, as long as there is a scarf or shawl on your head, you are good to go. Long trousers, normal denim or tight leggings, or a long skirt and a tunic long enough to cover your hips will complete the dress code. Even if it’s summer, no short sleeves or sleeveless t-shirts, rather long or three-quarter sleeves. Once you have decided what places to visit in Iran, you need to plan your domestic travel. Below some of my suggestions based on what I did myself. The country is so large that if there is the connection, the fastest way to travel in Iran is by plane. Iranian airlines IranAir and Mahan Air cover many routes. I flew from Tehran to Shiraz with Mahan Air and from Yazd to Tehran with IranAir. Since Iran is still under sanctions, you can’t book the flights through the airlines’ websites. For now, you can go to a travel agency once there, they will book it for you and you pay cash. Through 1stQuest website, an Iranian travel agency with offices abroad that allows Visa and Mastercard payments, you can book domestic flights in Iran. Click here to check prices and routes. An alternative way to go from a city to another in your 10 days in Iran is by bus or train. There are usually many buses that depart at any time of the day and night so you can book even last minute. Except during Nowruz, obviously, when there are even more buses scheduled but you will hardly find any seat. I took the train from Tehran to Tabriz and from Yazd to Tehran and both experiences were great. The one to Tabriz was a night train, we were served a small dinner and beds were comfortable. On the other hand, I took the bus many times to go to Isfahan, Yazd, and Gilan. If you take a bus, prefer the VIP, they are more comfortable, seats recline to become almost beds, and if the route is long they serve a meal and a drink. Through 1stQuest website you can already book the local extra-urban buses and soon also the trains. Click here to book online the domestic buses from a city to another. During your Iran trip, you might want to stay connected with family and friends. However, with your SIM card, you will have the additional roaming charges, that often can cost you a leg and an arm. This is why we recommend you get yourself an Iranian SIM card. As a foreigner, you can buy a SIM card registered with your passport, although it’s much less of a headache to buy from phone stores one that is already registered. If the SIM needs to be cut to fit the slot of your phone, they will do it there straight away. There are a few SIM providers, those that I recommend are Irancell and Rightel. The prices are pretty much the same for both SIM card and data bundles. I tried also MCI, cheaper than the other ones but it gave me always problems with the internet connection so, in the end, I switched. Below roughly the prices. In Iran some social media and websites are subject to government filter, so to access them you need a VPN (Virtual Private Network). There are many VPNs, some are cheap and some are even free. Trust me, between living a year in China and travelling to Iran repeatedly, I tried quite a few brands, also a free one that broke down two of my phones. Now the one I always buy is ExpressVPN: not too expensive, fast connection, some 145 server locations in 94 countries, you can install it on different devices such as a laptop, a mobile phone, and a tablet, and especially, it doesn’t mess up with your phone! Click here for more information on different packages of ExpressVPN and the latest prices. Since our Visa and Mastercard don’t work in Iran banks, you can’t withdraw money from the local ATMs. This means you need to carry with you enough cash for the whole holiday and exchanged it into the Iranian currency, rials, once in Iran. Apparently, tourists can also get what’s known as a “bank tourist card” that they can top up at their arrival to use as a normal ATM or credit card all over Iran to avoid carrying too much. I’ve never done it, but it’s worth inquiring at the Bank Melli branch at Tehran Khomeini Airport upon arrival. It’s open 24/7 and they will explain better how it works and if it’s actually already operative. While it was possible to exchange money also at exchange agencies around the city, now the government has ruled that money exchange can only be done at the bank. So, do exchange whatever you feel at the airport’s bank to be hassle-free for the first days. Banks are all over the city wherever you go. In most of the popular places to visit in Iran, you will find exchange agencies, usually located in the city centre. After choosing what places to visit in Iran, you need to pick your accommodations. Another effect of the sanctions is that you can’t book hotels online. You can search for hotel names and book them by sending an email or calling them, but sometimes it has happened that they don’t keep the booking and it can turn into an unpleasant experience. The best place to book an Iranian hotel online is through the local agency 1stQuest. They have a wide range of accommodations of every type and for every budget in many cities in Iran. ⇒ Click here to search for hotels and check the price. An alternative is to book a hotel through an Iranian tour agency or book a complete Iran tour with G Adventures. Their Discover Persia 14-day tour will take you to the most popular Iran destinations, will sort out for you logistics such as visa, hotels and domestic transport, and will also leave you some free time to roam around by yourself. What language do they speak in Iran? The official language in Iran is Persian (Farsi), and while in the most popular areas you will find many people able to speak English if you go to more offbeat provinces or in neighbourhoods that mainly see locals, you will have a bit of a hard time. This is why you can always learn some Farsi words and sentences before travelling to Iran. We have written two posts with tips in Farsi, one to help when you ask for directions, one for ordering food when eating out in Iran. Tehran became the capital of Iran in the 19th century during the Qajar era. Located along and framed by the southern side of Alborz mountain range of mountains, with almost 8 million people, Tehran is the most populated city in Iran. It has two international airports, Mehrabad and Imam Khomeini, where you are very likely to land, so it’s from here that you can start your Iran trip. 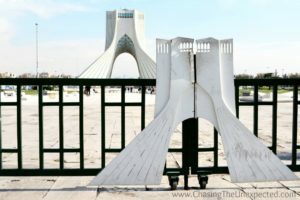 Too often tour companies don’t include Tehran among places to visit in Iran because the mental traffic would slow them down too much. I disagree. With royal palaces, beautiful parks, busy bazaars and a vibrant lifestyle, the things to do in Tehran are countless. Azadi Tower. “Borj-e Azadi”, Persian for Freedom Tower, is one of the first things to see in Tehran. Commissioned by Iran’s last shah, Mohammad Reza Pahlavi and inaugurated in 1971 to celebrate the 2500th anniversary of the Persian Empire, before the 1979 Revolution it was known as Shahyad Tower, Kings’ Memorial. It’s not just the symbol of Tehran but it has also been mentioned as the symbol of Iran. The architecture of Azadi Tower is inspired by Achaemenid, Sassanian and Islamic styles. This 45-meter-high three-story building has four elevators and two staircases with 286 stairs. Below the tower, there are exhibition halls, library, a museum and a gallery. Azadi Tower is located in the centre of Azadi Square, “Meidan Azadi”, which, with 65.000 square meters, is the biggest square in Tehran and probably in all of Iran. Opening hours: Sunday-Thursday 9 am-6 pm. On Fridays 10 am-6 pm. Golestan Palace “Kakhe Golestan”. UNESCO-enlisted Golestan Palace is one of the favourite Tehran attractions and definitely one of the places to visit in Iran. It was originally built in the 16th Century by Shah Abbas and later rebuilt during Qajar Era. A wing of the palace was devoted to the wives and mistresses of the Qajar kings. Some sources say the number of wives and courtesans sometimes reached more than 400. The complex is huge and for a complete visit to the Golestan Palace, you can set aside at least two hours. Some of the areas not to miss are the Marble Throne, dating back from the year of Agha Mohammad Khan Qajar’s coronation ceremony, the Springhouse, the restaurant “Sofrakhane”, Salam Hall, Aineh Hall, Shamsul Emara, Khalwat Karim Khan, the gallery and the museum. Entry fee: 150.000 Rials (5 USD). Tehran Grand Bazaar. “Bazaar-e Bozorg-e Tehran”, stretching for some twenty square kilometres, is absolutely one of the places to visit in Tehran and one of the favourite Iran tourist attractions. As soon as you enter this covered market you can feel the traditional atmosphere of the ancient Iranian architecture. Tehran Grand Bazaar has everything you are looking for, be it clothes, handicraft, restaurants, nuts, jewellery, rugs and more. The shops of saddle makers “saraj”, horseshoe makers “nal chiha” and carpet traders “labof” are in the oldest parts of the Grand Bazaar. Alongside countless shops, Tehran Grand Bazaar boasts also historical monuments such as the two mosques Masjid Jama and Masjid Imam. Days before major holidays I suggest you avoid it because it’s going to be very crowded. Opening hours: Daily except for Fridays and national holidays 8 am-6 pm. On Thursdays, most shops are open only until noon. Tajrish Bazaar. One of Tehran’s oldest bazaars, it’s located in northern Tehran. Less touristy and crowded than the Grand Bazaar, Tajrish Bazaar is packed with pretty good quality shops. Do here your shopping if you like to take your time. You can find stuff such as handicraft, copper and clay pots, varieties of pistachios, pastries, saffron, spices, pickles “Turoshi” and fresh fruits. Address: Southwest of Tajrish Square, one entrance on Imamzadeh Saleh shrine, the other on Qods Square. Opening hours: Daily 9 am-10 pm. As for the Grand Bazaar, we suggest you don’t go on weekends (Fridays) as many shops are closed. Niavaran Palace – “Kakh-e Niavaran”. The 9000-square-meter complex of Niavaran Palace was originally built in the 19th century during the Qajar dynasty. Later, king “Shah” Mohammad Reza Pahlavi built and renovated many parts of it to use it for the residence of the royal family during all seasons except summer. The ground floor of Niavaran Palace Iranian displays an exquisite collection of handmade Persian carpets including the artistic portraits of kings and famous figures from Achaemenid and Qajar times. In the second floor, there is the statue of Buddha and stone carvings from the 3rd century AD alongside a collection of Mohammad Reza Pahlavi’s personal and military clothes, while along the stairs of the second floor the decoration is a beautiful painting from Karim Khan’s palace. In addition to old and contemporary artwork, in Niavaran Palace you can have a clue of the luxurious life led by the royal family, you can see the kids’ toys in their room, Farah Diba’s clothes still hanging in the wardrobe, even her nail polish. On the dining room, the lavish table is set as if guests were about to arrive. Part of Niavaran Palace complex is also a tea house, a museum and a park. This is a must-see in your Iran 10-day itinerary. Address: Northeastern Tehran, District 1, Niavaran Square. Saad Abad Complex and Green Palace – “Majmooa Saad Abbad”. Counting some eighteen palaces belonging to the Qajar and Pahlavi kings, Saadabad is a cultural and historical complex. It covers one square kilometre and is located in the north of Tehran. The complex was first built and inhabited by the Qajar king in the 19th century. Reza Shah Pahlavi lived in Sad Abad Complex in the 1920s, while his son, Mohammad Reza, moved there in the 1970s. After the 1979 Islamic Revolution, the complex was turned into a museum. Address: 50 Kamal Taheri St., Za’feraniyeh, Vali’Asr Ave. Opening hours: Spring and summer (March 20th to September 20th), open daily except for religious holidays, 9 am-6,30 pm, last entry 5 pm. Autumn and winter (September 21st to March 19th), open daily except religious holidays, 9 am-5 pm, last entry 4 pm. National Museum of Iran and Museum of Islamic Era – “Moozeh Mili Iran”. Even though they are two separate buildings, both museums were built in the 20th century and are to be included on your list of places to visit in Iran if it’s your first trip. Displaying some 300,000 objects, they are considered Iran’s most important museums. If you want to find out about Iranian culture, art, and traditions, these are the places to go. Covering a time span of centuries, from prehistoric times on the Iranian Plateau to pre-Islamic eras up to Islamic times, the museums will show you anything you want to know about Iran. Jewellery Museum – “Moozeh Jawaherat”. This priceless treasury was originally kept in Golestan Palace, in the 20th century Pahlavi moved 21 boxes filled with jewellery to Iran National Bank, and in the 1960s it was moved to the current location, the Central Bank of Iran. It’s an impressive collection of some of the world’s most expensive and precious jewellery gathered over the centuries such as diamonds, emeralds, rubies and turquoise stones. One of the most exclusive places to visit in Iran. Address: Imam Khomeini Square, Ferdowsi Avenue, in front of the Turkish Embassy. Opening hours: Saturday to Tuesday 2 pm-4.30 pm, Wednesday to Friday closed. Note: Children under 12 are not allowed. Photography is not allowed. Nature Bridge “Pol-e Tabiat”. Designed by Iranian architect Leila Araghian and built between 2010 and 2014, the 270-meter-long bridge is the largest pedestrian overpass built in Iran to connect two parks in northern Tehran. On your way to the edge of the lovely Fire and Water Park “Ab-o-Atash Park,” you can stop at the many restaurants and coffee shops to relax enjoying a beautiful view of Tehran and the Alborz mountains. Always packed with locals, Pol-e Tabiat is stunning from afar at night when it’s all spruced up with colourful lights. Chitgar Lake – “Daryacheh Chitak”. Located in northwestern Tehran on Hemmat Gharb Highway, Chitgar Lake is Iran’s largest artificial lake and the biggest entertainment complex in the capital built on 140 hectares of land. Many go to this area to spend their free time watching birds, doing water sports activities, biking, or just even walking. Artists’ Garden. Lovely park devoted to local artists not far from the former US embassy, it houses halls that always host temporary exhibitions. Located in the city centre, it also has a theatre hall and season markets selling handicrafts and artwork. If you are tired of the ubiquitous kebabs, here you can have a nice alternative lunch at the vegetarian restaurant cafe within the park. “Meidan Enghelab” (Revolution Square) and “Kheiaban Enghelab” (Revolution Street). This 20th-century square was originally named “24 Esfand Square” after Pahlavi’s birthday and used to display his statue in the middle. After the Iranian Revolution, the statue was removed and the named changed into Enqelab/Revolution Square. It’s one of the busiest squares in the city, close to Tehran University and lined up with bookshops and trendy coffee shops where students like to hang out. Do enjoy some tea and cake in some of the laid-back cafes all along Enghelab Street to refuel while exploring the historical places of Tehran. Darband. Located north of Sad Abad Garden some 1700 meters above sea level, Darband is the beginning of one of the main paths hikers take to climb to the Alborz mountains. During the Qajar era, this beautiful place was chosen as the favourite dwelling by members of the royal family. It’s a tourist draw for both Iranians and tourists who want relax and enjoy local food, tea, and hookah with a beautiful view. In summer the weather is pretty nice and not as hot as in Tehran city. On Fridays, it gets pretty crowded because many people from Tehran and surroundings head there with their families. If you want some peace and quiet, I suggest you go during the week. You might see guys carrying cages with birds and folded papers on the side of the cage. They are called “fall gir“, Iran’s version of fortune tellers. Basically, the bird picks one of the folded papers and whatever is written will reveal how good of a person you are, what to expect from your future and all the things we wish to know in advance. If you can’t hike, chairlifts will take you up. Milad Tower – “Borj-e Milad”. Rising some 435 meters, Milad Tower the 6th tallest tower in the world. Perfect place to admire Tehran cityscape both by day and in the evening for a night view. Borj-e Milad hosts museums, a paintball field, a dolphin show, a movie theatre, a restaurant and a cafe. Opening hours: Daily 9 am-9 pm. Entrance fee: Free admission for kids under 6. The full package ticket is 350,000 rials, but if you want to visit only the open platform, the ticket is 120,000 rials. You can buy the ticket at the counter below the tower. Not only places to visit in Iran but also great dishes to eat! Being a big city, Tehran has a huge choice of restaurants. One of my very favourite places is Khorshid Traditional Restaurant in 130 Ravanmehr St., not far from Enghelab Street. It’s open from noon to 10 pm and alongside lunch and dinner, you can also have your tea/coffee there. Food is absolutely delicious. If you are tired of your usual kebab and want to go veggie for a day, try Ananda Vegetarian Restaurant in 18 South Ekhtiyariyeh. It’s open from 9 am to around 11 pm and they have a good choice of lasagna, pizza and many vegetarian and vegan treats. Totally recommended. Alborz Restaurant, in Nikouqadam Street, District 7, is famous for its 50-centimetre kebabs, along with sheep and lamb steaks, rice and fish. Not too expensive but slightly more expensive than a normal restaurant in Tehran. Open daily 11 am-11 pm. Alighapoo Restaurant in Vanak, beginning of Gandhi Street, District 4, is a beautiful Tehrani traditional restaurant serving different Persian dishes and often showing live Persian music performances. You can also reserve a table before you go, the price is slightly expensive but worth it as the food is nice and the place gives you a good picture of old Tehran cafes and restaurants. Tehran has a wide choice of hotels to meet all budgets and needs. Here are some picks of Tehran hotels with different prices, more or less expensive. To read more about the options you have, check out our guide to the best hotels in Tehran. If you are on a budget, a good option is Khayyam Hotel (Navidi Alley, Amir Kabir Avenue). Basic services and facilities, English-speaking friendly staff, cleaning personnel always available to clean your room if you ask, WIFI and breakfast included. Khayyam Hotel is about 10 minutes walk from Mellat metro station (blue line), and some 15 minutes from Imam Khomeini metro station, the hub of different lines. A stone’s throw away from Tehran Grand Bazaar. Infrastructure is very basic, no lift, when I stayed there last November the price was around 30 USD per night for a single room with private bathroom. Another option is Golestan Hotel (Hafez St. 14, Hassan Abad sq.) Very close to Hasan Abad metro station, this accommodation, too, is pretty modest, no lift and you can choose between rooms with or without private bathroom. Some 30 USD per night, WIFI and breakfast included. Click here to see availability and current rates for the Golestan Hotel in Tehran. If you prefer better rooms and are willing to pay more, other options are the popular Espinas Palace Hotel in Tehran, a 5-star lodging close to Valiasr and Engelab streets and metro stations (some 300/350 USD per double or twin room), Hally Hotel, a central 3-star located near US former embassy and Saint Joseph church (around 100 USD per night for a single room, 130 for a double), 5-star Homa Hotel, also near busy Valiasr Street and many metro station (around 200 USD for a double), or boutique hotel Aramis, also in Valiasr St. (from 200 to 300 USD for the suites). In Tehran, I always suggest taking the metro to avoid getting stuck in the city’s mental traffic. Tehran Metro is very wide and gets to most parts of the city. If you can, try to avoid the peak hours, early morning and afternoon between 4 and 6 pm, it gets so crowded you can risk missing your stop. Solo women travellers can choose to get in the women’s section, the first and last car, they are usually less crowded and you can relax. If you are looking for more places to visit in Iran, don’t forget to include Shiraz. The homeland of Persian civilization and capital of Fars Province, Shiraz is the city of poets and nightingales. Here you will walk around jasmine-scented streets, you will test Iranians’ knack for romance and you will visit the immortal vestiges left by Cyrus the Great and Darius the Great. 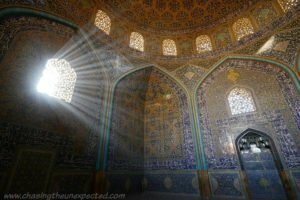 Here are some of the things to do in Shiraz if you decide to include it in the itinerary of your Iran trip. Persepolis and Pasargadae. Impossible to not include Persepolis on your list of places to visit in Iran. 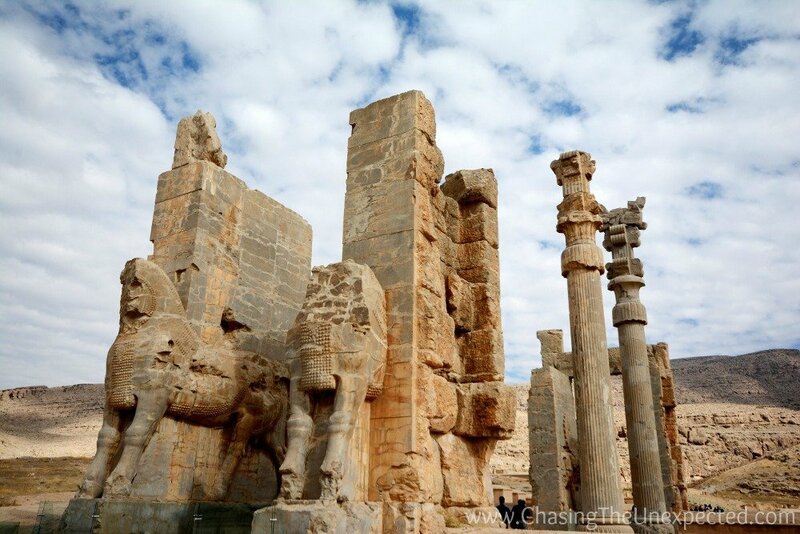 The vestiges of the great Persian Achaemenid Empire are a must for anyone who wants to visit Shiraz. 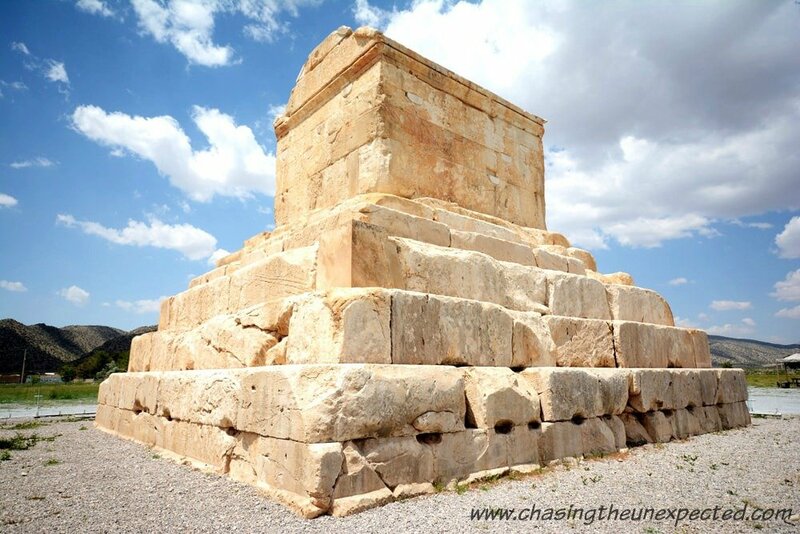 Start from Pasargadae, some 140 km from Shiraz, the first capital of the Empire founded by Cyrus the Great (Kourosh-e Bozorg), and on your way back to Shiraz stop at the mighty Persepolis, ceremonial capital of the Achaemenids where Darius the Great welcomed officials and dignitaries from the other countries. Before leaving the ancient world, make a stop at the stunning Naqsh-e Rostam burial complex. Opening hours: Daily 8 am-5 pm November to March, 8 am-7 pm April-October. Nasir al-Molk Mosque. 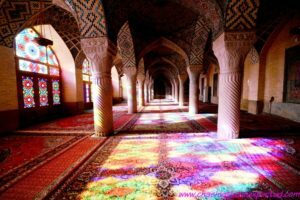 Start your Shiraz tour at Nasir al-Molk mosque first thing in the morning. Why the morning? Because the sun rays seeping through the stained glass windows create a beautiful interplay, and this happens only in the morning. If you go in the afternoon, you might miss the light effects, but the sophisticated decorations won’t fail to enchant you, both inside and outside. Whether in the morning or in the afternoon, this is absolutely one of the places to visit in Iran. Address: Loft Ali Khan Zand St.
Vakil Bazaar. Stroll around historical Vakil Bazaar, a maze of narrow alleys covered with vaulted ceilings. This market dates back to the Zand dynasty and is part of Karim Khan’s plan to make Shiraz a trading hub. Definitely to include among the things to do in Shiraz. Opening hours: Daily except for Fridays. Vakil Mosque. Not far from Vakil Bazaar and in the district bearing the same name, Vakil Mosque is also one of the places to see in Iran. Dating back to Karim Khan’s era like the rest of the neighbourhood, this mosque sprawls over some 11,000 square kilometres and boasts 48 pillars and a minbar (pulpit) with 14 marble stairs. Right in front of the entrance, there are the traditional baths (hammam) now open to the public to show how life was organized and the different roles in the society through a series of statues. Opening hours: Daily 8 am-8 pm. Hafez Mausoleum. You are in the city of poets so don’t miss Hafez mausoleum, also called Hafezieh by Iranians, absolutely one of the best places to visit in Iran. Apart from the fine architecture and decoration, this is one of the places to visit in Iran even only to join the locals gathered around his simple grave almost as if on a pilgrimage to read his verses that are so important in their lives and traditions. Saadi Mausoleum. After Hafezieh, visit the mausoleum of the other famous Shirazi poet, Saadi. 13th-century traveller and sage, his tomb underwent several renovations and today lies in a beautiful garden with a tree-lined boulevard. His remains rest under a blue-hued dome and are surrounded by decorations of traditional calligraphy chronicling his life. Fort (Arg) of Karim Khan. The fort of Karim Khan is to be listed among the places to see in Shiraz. Located in the city centre, it dates back to the Zand dynasty and its interior comprises also of the traditional baths (hammam). In front of its entrance is a lovely park where locals like to relax in the evening, and just behind the fort is the best shop for Shirazi sweet faloodeh, cornstarch noodles dressed with sugar and rosewater syrup. You will spot it by the long queue! Opening Hours: Daily 7.30 am-9 pm April-October; 8 am-8 pm November-March. Eram Garden. As you are in the city of gardens, you can’t possibly miss Eram Garden. Stroll around the now Botanical Garden of Shiraz University displaying a diverse collection of plants, trees, and flowers. Made following the principles of the Persian garden, concept enlisted by UNESCO as a heritage of humanity, in the middle, there is a pool representing the water element and a modern pavilion dating back to the Qajar dynasty. Narenjestan Garden. 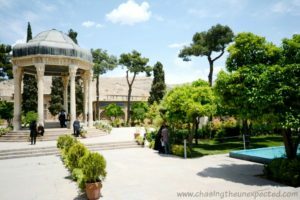 If you have more time in Shiraz and feel like getting intoxicated with orange and flower scents and colours, visit the beautiful Narenjestan Garden. Inside, the mirror hall of Khan-e Zinat al-Molk, the House of Zinat al-Molk, will enchant you. To eat out in Shiraz you can try places like Haft Khan Restaurant in 17th Alley (Kucheh Hef Daham) off Ayatollah Rabbani Blvd near Abulkalam Square, for a taste of both Persian and international cuisine. Here you have the choice to order à la carte or go with the buffet (some 750,000 rials, around 20 USD). 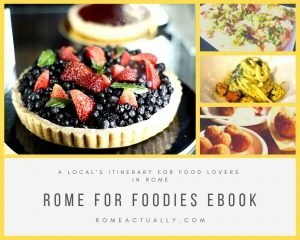 It’s a bit pricey, but the complex is worth visiting and the food is very nice. Another restaurant in Shiraz is Bagh Raaz in Shahed Blvd, also a bit expensive but they serve good food. You can grab your table in their garden or on the rooftop for a lunch with vista. I’ve always found Shiraz as one of the best cities in Iran for hotels as they have a good quality-price ratio and also more comforts and better infrastructure compared to other cities, Tehran included. Here are some suggestions on Shiraz hotels. Among the Shiraz hotels where you won’t spend a fortune but that still are a good choice, I found comfortable the Arg Hotel, pretty central, some 50 USD per night in a single room and 80 USD for a double, WIFI and breakfast included. Some others are 3-star Karimkhan Hotel (around 65 USD per night), or less expensive Sasan and Niayesh Boutique, both 2-star and around 45 USD per night in a single room. One of my very favourite 4-star accommodations in Shiraz is by far the Elysee Hotel. Rooms are modern, comfortable and well- equipped, and prices range around 90 USD per night for a single, and 150 for a double, WIFI and breakfast included. Click here to see availability and current prices for Elysee Hotel in Shiraz. Among the others are the Eram Hotel, very central, equipped with all comforts, a pretty new building, has an elevator and the breakfast is rich a lovely; Zandiyeh Hotel, a pretty central 5-star that costs some 130 USD for a single and 200 USD for a double, or International Pars Hotel, 4-star, some 80 USD for a single and 120 in a double per night. –>> Click here to search for Shiraz hotels and read the reviews. Shiraz is not that big, so you can move either on foot, by bus or by metro, opened in 2014, or even by taxi. While the bus is a less expensive option, taxi is not too expensive either. If you do take a cab, try to have your destination written to make it easier for the driver as they might not understand your pronunciation, even though in Shiraz people, drivers included, are very friendly and super chatty, so they will probably try their best in English too. The city centre and Vakil Bazaar are very nice to be visited walking, especially if you are on the lookout for some nice photography subjects. Its beauty earned Isfahan the moniker of “half of the world”, and if you are still making your itinerary, don’t forget to include this city among the places to visit in Iran. The capital of Safavid Persia, Isfahan is an oasis. if you are still wondering what to visit in Iran, below I mention the most important things to do in Isfahan. Naqsh-e Jahan (Imam Square) and bazaar. Literally “map of the world”, Naqsh-e Jahan is where you will start your tour of Isfahan and by all means one of the most important places to visit in Iran if you are travelling here for the first time. Listed as world heritage site by UNESCO in 1979, Imam Square (Meidan Emam) is surrounded by the beautiful bazaar that served as a trading hub in the Middle Ages when the city was an important stop along the silk road. Alongside the bazaar, many are the buildings reflecting on the large pool in the middle of the square. Imam Mosque. Located on one of the edges of Imam Square, Imam Mosque (formerly known as Shah Mosque in honour of Shah Abbas, and renamed after the 1979 Revolution) is a beautiful example of Safavid Islamic architecture. Absolutely to include on your list of things to see in Isfahan to admire its sophisticated decorations where Persian blue is the undisputed star. Sheikh Lotfollah Mosque. The only mosque without minarets, Sheikh Lotfollah Mosque was actually a private worship place that hosted an Islamic school. Interior decorations never fail to bedazzle its visitors, this is one of the most photographed sights in Isfahan. On its ceiling, you can see the tail of a peacock shaped by the light seeping through the dome, ruse to reproduce an otherwise forbidden animal figure as decoration. Beautiful and making a fantastic photography subject, this is one of the favourite places of interest in Iran. Ali Qapu Palace – “Kakh-e Ali Qapu”. Royal palace overlooking Imam Square and facing Sheikh Lotfollah Mosque, Kakh-e Ali Qapu was built in the 16th century as a residence of Shah Abbas. Fresco-embellished and with colourful staircases, if you go up to the last floor you will end up in the stunning music hall to admire its stunning “music-themed” decorations. Definitely one of the places to visit in Iran. Chehel Sotoun. “Forty pillars” in Persian, Chehel Sotoun is a Safavid-era pavilion located behind Naqsh-e Jahan. Reflecting on the large pool, the supporting pillars seem forty, hence the name. Here Shah Abbas II had his parties and welcomed foreign dignitaries and ambassadors. Hash Behesht. Still wondering what to do in Iran? On the way to Chahar Bagh Street, stop at the diamond-shaped palace known as Hasht Behesht, literally “eight heavens”. Part of a park, today open to the public, this palace served as the residence for the royal family. Address: Chahar Bagh-e Abbasi St.
New Jolfa. Isfahan’s Armenian quarter New Jolfa is one of the places to visit in Iran. Envisioned by Herat-born Shah Abbas the Great who wanted to import to his capital the ability Armenian craftsmen, today it’s a laid-back, quaint neighbourhood packed with lovely restaurants, coffee shops (Firouz Sherbat cafe never disappoints), local markets, bakeries and pastry shops. Vank Cathedral. Within Jolfa quarter, don’t miss the Vank Cathedral, the main Christian worship place in Isfahan and also the main landmark in the Armenian neighbourhood. Started in 1606 and completed in 1665, the church has an austere exterior that becomes a feast of paintings and decorations once inside. Si-o-seh Pol Bridge. Spend at least one evening in Isfahan walking along Si-o-seh Pol Bridge, literally “33 pillars”. Here locals love to relax, enjoy a thermos of tea and stroll along the river. There are quite a few eateries I loved in Isfahan. One is Shahrzaad Restaurant, very close to Naqsh-e Jahan, in Abbas Abad St., off Chahar Bagh Abbasi. Delicious Persian dishes, lovely Qajar-era settings, and affordable prices. Plus, the location is hard to beat. Also, the eateries in Jolfa district won’t disappoint you. Try the above mentioned Firouz Cafe for a tea and one of their exquisite cakes, and for lunch or dinner grab a table at Hermes Cafe & Restaurant, in Jolfa Alley off Nazar Street. They serve Mediterranean cuisine in a modern decor at quite affordable prices. As one of the most popular tourist hubs in Iran, Isfahan has a wide choice of hotels for every needs and budget. Below some suggestions. As cheap hotels in Isfahan you can take into consideration places like Iran Hotel for 35 USD per night for a single room and 56 for a double, basic facilities and rooms with private bathroom, WIFI and breakfast included, or Azadi Hotel, a 3-star where a single room is 50 USD per night and a double about 90, breakfast included. Among the higher-priced accommodations there is 5-star Abbasi Hotel for about 160 USD per night, WIFI, breakfast and several facilities included. Click here to see availability and current rates for the Abbasi Hotel in Isfahan. –>> Search for Isfahan hotels on TripAdvisor and read customers’ reviews! Isfahan is pretty pleasant to be explored on foot. The major landmarks are close to each other and easy to reach. The one a bit far is Jolfa quarter and you can take a taxi to get there quickly, as it’s not too expensive. Charming Zoroastrian desert city, Yazd must absolutely be included among the places to visit in Iran if it’s your first trip. A forest of badgir (windcatchers) defining its skyline, Yazd is an oasis in the middle of the desert in central Iran, and walking its alleys reveals the traditional life and architecture of a hostile habitat and nature. If you are still wondering what are the main places of interest in Iran, here are some of the places to see in Yazd. Yazd Grand Mosque. A true masterpiece of Islamic art and architecture of the 14th century, Yazd Grand Mosque is a feast of symbols, decorations and geometric shapes in many different nuances of blue. One of the most popular landmarks in Yazd, it’s definitely one of the places to visit in Iran. Fahadan quarter. Get lost in the old Fahadan quarter, one of Yazd’s central districts, a maze of narrow alleys and traditional mud houses that give the typical ochre colour to the area. The heart of the city and the most historical district, this is now one of the favourite Iran tourist attractions. Zoroastrian Fire Temple. Heart of Zoroastrian Persia, the Fire Temple is one of the must-see places in Yazd. Enshrined behind a glass is the fire that is believed to be burning for more than 1,500 years. Alongside being a tourist attraction in Yazd, this temple is still a worship place for the followers of the ancient Zoroastrian creed. Towers of Silence. To remain within the Zoroastrian religion, take a taxi and head to the so-called Towers of Silence. Ancient burial site of the Zoroastrian cult, this is where they used to place the bodies of their dead so that animals and weather conditions would contribute to the decomposition. For hygienic reasons now they are not in use anymore, but they can be visited up to the top. Amir Chakhmak Complex. Stunning, a feast for the eyes and with a fascinating history entangled with the local life throughout the centuries, Amir Chakhmak Complex is central and multipurpose. It comprises of a mosque, an Islamic school and the nearby bazaar, and it’s one of the places you can’t miss in Yazd. Close to the complex you will find the best baklava (typical sweets) shop in town. Make sure the long queue won’t scare you away. Yazd Bazaar – Khan Market. Absolutely one of the places to visit in Iran, by walking around Yazd Grand Bazaar you will soak in history and tradition. Alongside the traditional shops, at Yazd bazaar, you can also see a qanat, old water storage, and a caravanserai, where traders stopped to rest when travelling along the silk road for their trades. Opening hours: 8 am-8 pm. Dolat Abad Garden. 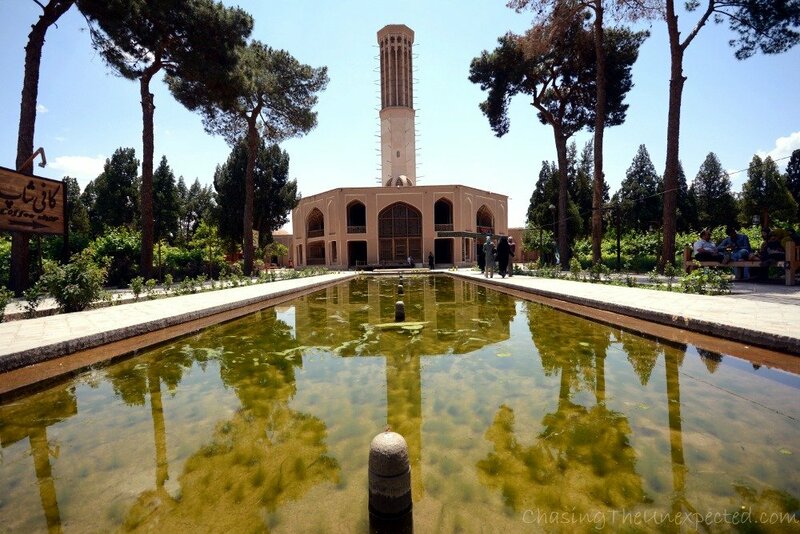 Home to Yazd’s (and Iran’s) tallest wind catcher, Dolat Abad Garden is an oasis in the middle of the desert. Typical Persian-style garden, Dolat Abad (also spelt Dowlat Abad) dates back to the 18th century and was declared world heritage site by UNESCO in 2011. Sit at their tea house to relax before resuming your sightseeing in Yazd. A good eatery in Yazd is the hotel we stayed in, Kohan, also tourists staying at other hotels used to come here just to eat. I had delicious soups, eggplant stews, and rice, alongside with tea, obviously. Fahadan Hotel, too, has a nice restaurant, also with buffet serving Mediterranean, Persian and international cuisine. Try Khane Dohad Traditional Restaurant in Sangrized Alley off Shahid Asiazadeh Blvd. Delicious Persian dishes including ash (soups) and treats such as Ghorme Fesenjan, chicken or lamb stew with walnuts and pomegranate, obviously served with rice. Yazd has always had a pretty good choice of hotels, both budget and medium/high types. 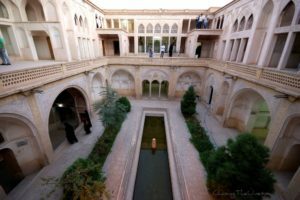 What I’ve liked in Yazd hotels is that often they are traditional houses turned into modern accommodations, so with a large courtyard in the middle that either serves as a restaurant or simple relaxing place decorated with the large sofas (takht) where you can have your tea or hookah. Among the options of budget hotels in Yazd, you can consider Kohan hotel. Basic but cosy, their rooms have private bathroom and AC/heating system. Rates are 50 USD for a single and 70 USD for a double, WIFI and breakfast included. Some other even less expensive are Royaye Qadim, Parsian Azadi or Khatam, all 3-star and around 50/55 USD per night in a single room and 80 USD in a double. If you want to spend a little more, try Fahadan Hotel in the central district it was named after. A big traditional house turned into a hotel with all comforts, nice restaurant included. Prices range from 60/70 USD for a single room to around 100 for a double. Other places worth a try are Dad Hotel, Moshir al-Mamalek and Mehr, all 4-star and for about 100 USD per night. –>> Search for Yazd hotels here and read customers’ reviews! Move around Yazd on foot to avoid missing on the quaint corners of this desert city and its typical architecture. Fahadan district, the Grand Bazaar and Amir Chakhmak complex are all close to each other, and only some of the landmarks are far, such as the Towers of Silence, for which I suggest you rent a taxi. Often left out of tours and itineraries mainly because of lack of time, Kashan is a desert town worth a stop and one of the popular Iran tourist destinations. If you still have a couple of days and you are wondering what other places to visit in Iran, do devote some time to Kashan, you won’t regret it. Grand Mosque. Not very old but of elaborate architecture, Kashan main mosque, Masjid-e Agha Bozorg, is one of the places to visit in the city. Abbasian House. The Abbasian House will give you a glimpse into the not-so-old wealthy Iranian private life. Built with typical desert features, this house has a beautiful internal courtyard and its own badgir to make rooms cooler during summer. Kashan Bazaar. Considered one of Iran’s most interesting markets, the historical bazaar of Kashan is absolutely a must. While the modern aspect dates back to the 19th century, this bazaar has been a popular trading hub for at least 800 years. Opening hours: 9.30 am-8.30 pm. Closed on Fridays. Bagh-e Fin Garden. Considered one of the best examples of Persian gardens, Bagh-e Fin was built by Shah Abbas and comprises of several buildings, among which the hammam where Amir Kabir, Iranian prime minister from 1848 to 1851, was murdered. Dasht-e Kavir Desert. Also known as Salt Desert, if you stay some more days in Kashan you can organize a tour of this beautiful desert, famous for being one of the best places to visit in Iran. Abyaneh. Not far from Kashan, at the foot of Karkas Mount, lies Abyaneh, absolutely one of the places to visit in Iran as it’s one of its oldest towns where the mud houses give it the typical ochre colour. To eat out in Kashan, try places such as Abbasi Restaurant (رستوران عباسی), located in the traditional Abbasian House in Alavi Street, that serves Iranian cuisine. Comfortable takht (benches/sofas) covered with carpets and cushions to lean on and surrounded by little trees, pools and a fountain. Iranians go there too, which guarantees the quality. Prices are slightly higher than other restaurants, but it’s worth it. Open 12-3 pm and 7-11 pm. Another eatery to try is Mozaffari Traditional Restaurant (رستوران و سفره خانه سنتی مظفری) also in Alavi street, in front of historical Taba Tabaie house. It’s a nice traditional Persian house with comfortable takht both in the open-air and under the roof with little pools all around. They serve Persian traditional food, tea, and hookah. Open daily 12-3 pm and 7-10 pm. Kashan too has a decent choice of hotels. 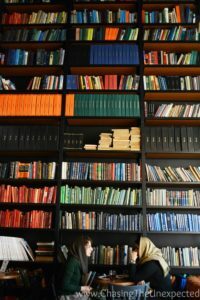 Among the less expensive you can find names such as Memary Youth Hostel, or Morshedi, 50 USD in a single room and between 80 and 130 for a double. For a better accommodation, check out 4-star Mahinestan Raheb, Ehsan Historical House or Manouchehri Traditional House, all for about 100 USD for a double room. TIP: Search for more Kashan hotels and read customers’ review. Move around Kashan on foot for the main landmarks or by taxi. Hire a driver if you are going to Abyaneh or a tour guide for the desert trip. Usually, you would be able to arrange these at your hotel. This is a guide to the places to visit in Iran in 10 days. You will be a bit tight with the time, but you can choose what to see or what to skip. I added some extra things to do in case you can stay longer. Enjoy your Iran trip! Awesome recommendations. I used ExpressVPN in China and it worked great. Think I’ll reactivate my account before my trip to Tehran next month. Missed some *very* interesting bits like the south / gulf, Kerman, the dasht-e-lut, Mashad, the caspian coast….the list goes on and on..
Hey Chizomiz, you don’t seem to have a *very* big experience as a tour guide, do you? How do you fit every single place in Iran in a 10-day tour? How about drawing different itineraries? I visited most places you have mentioned and many more, but I’ve been to Iran *many* times. We could NOT possibly mention all the attractions in Iran in A 10 DAYS GUIDE, Could we? Thanks for this post. It’s quite comprehensive. I’ve thought about visiting Iran for awhile now. I’ve got a US passport and a Filipino one as well. I’m sure I wouldn’t have issues getting a visa with the latter. Tehran seems like a beautiful city and it would be a shame to miss it based on the things I’ve read. The bazaars, the food, the people, and all the historical sites seems like that would make for an incredible visit. The mountains would be a lovely place to explore as well. Saving this post for a future time when I really start planning. 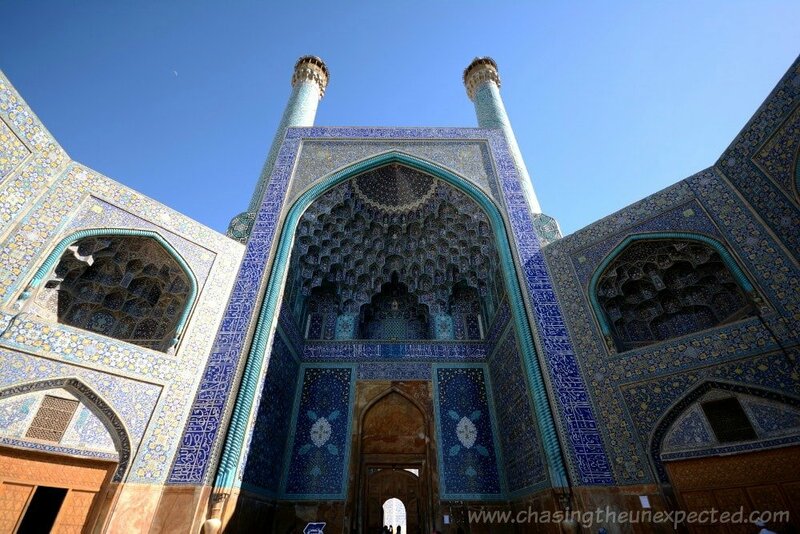 Great travel guide through Iran Angela! Iran is one of the top destinations for those who are looking for a unique travel experience. We will be visiting Iran next week. Please let us know what one must see during one evening in Mashhad. Also, If we were to see one or two important sites in Tehran due to lack of time what would that be. If you have only one evening in Mashhad I sure suggest the shrine of the Imam Reza. 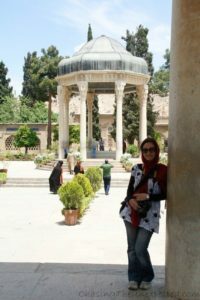 In Teheran don’t miss the Grand Bazaar and pick between the Golestan Palace or the National Museum, those are my picks, but there’s a lot to do! Great post about such a nice destination. I visited Iran twice and can’t wait to go back again. Interestingly enough, Iran has much more than these famous sites where everyone goes at first. I hope to see you again in the land of culture and nature.